"This new release features four Minnie-themed stories including a never-before-seen episode and a fun Minnie magnet bow frame. ‘Minnie’s Pajama Party,’ and ‘Minnie’s Bee Story,’ include Disney’s Adventure Mode – an interactive game using the remote control with multiple play levels. is a success - and it all ends in a Big Bow Show with the Clubhouse gang modeling the latest fashions under the biggest bow of all, a colorful, sky-high Rain-Bow. In a never-before-seen episode, Minnie’s Pajama Party Minnie and the girls set up a fun Pajama Party sleepover for the day – but it’s not as easy as it sounds, especially with the addition of Pete and Willie the Giant!" 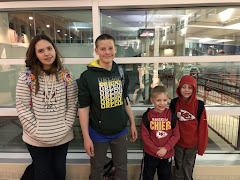 Family Time Factor: Probably best enjoyed by kids 6 and under. Not terrible to watch as a parent, but I'd much rather be cleaning, lol. 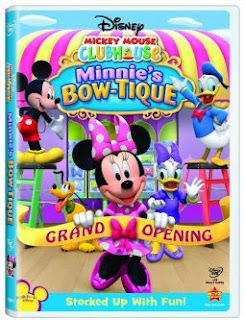 Minnie's Bow-Tique is available February 9 on DVD!! !